A lot of people come for making enquiries to know about a school or a college or a particular course they are interested in. Especially during the times of admission, you have to record all the communication made with the enquiries as a quick reference for future follow-ups by the same or a different admission counsellor and also to send the updated enquiry status report to the respective departments. Secondly, the institute needs send many notifications to students or their parents about Exam Schedules, Results, Classes, Vacations, about attendance, Peachier Meeting invitations and many other purposes. All these must be kept in record for quick reference for future follow-up or in case a parent complains of not receiving the information. How do you document such interaction that has happened between the student and the institute? How does an official from the administration, track the progress of a candidate during admission times for further development? For all this to happen, you need a campus automation software like ECAS (Enhanced Campus Automation System) which can keep records of all actions and communication occurred between the prospective enquiries or students and the institute. After filling up the basic details in the enquiry panel, in the communication module you can document the key points of interaction made between the students/parents and the enquiry official. This module is extremely useful in enquiry administration which keeps the management busiest during admission process in schools, colleges and universities. ECAS offers multiple fields to input like date of enquiry, reminder date, communication, response, mode of communication, person, etc. to note and schedule them. Reminders are very helpful during follow-ups so that the enquiry official does not miss to contact the candidate on the next appointment. Once you update these details, it is recorded in the database of the system. A quick list of today's followups can be draw by the admission counsellor or the public relation official at the beginning of the day. Officials with user permissions can draw the detailed communications report date-wise, student-wise, grade-wise. 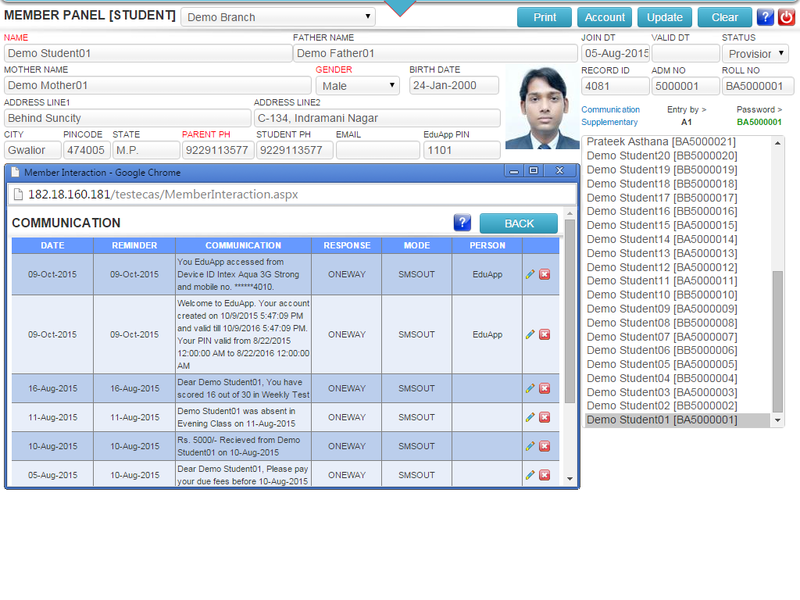 You can also set the priority parameters of a follow-up enquiry as low, average, high, etc. Past communication and future follow-up schedules can be viewed and printed in PDF format. Bulk messages or emails can be sent to students to update the students, lot of system generated information like Attendance, Fee dues reminders and receipt acknowledgements etc. These notifications will pop-up in the communications panel under the dashboard of that candidate. Communication management in an institute requires lot of automation and instantaneous updates for hassle free operations. It is very important to keep the institute administration updated on status of prospective candidates for admission during the enquiry and admission processes. ECAS with its communication module among the optimal set of modules can set the educational management system fully functional within one working day.